I know that I have said it before, but there is a certain satisfaction that comes from making a really good recipe for your family. Especially when that recipe is comfort food related and you haven't made it before. Most of the Chicken Pot Pies I have had in my life have come from a frozen meal of some sort. When I went about making it from scratch, what I didn't realize is how much better I would feel eating this one than the frozen pre-made options. The sodium content of some of those is high and leaves me feeling bloated and too full. This recipe was somehow lighter, yet still rich and creamy in texture - like a pot pie should be. I didn't fully make from scratch because I did use pre-made pie crust from the store and it's not like I'm going to go out and butcher my own chicken, but I did see everything that I put into the pot and it makes me feel good that I know what's in there. Some of the adaptations I will be trying in the future will be to make individual servings in ramekins - too cute; or using biscuit dough to top the pie instead of the pie crust...just curious though - would I need to call them Chicken Pot Biscuits at that point?! I will have to play with the cook time on those, as biscuits are different than pie crust. Either way, this was a tasty and relative quick cooking meal (30 min prep, 40 min cook and cool) for what it offers. Ooohh, I wonder if I could make on Sunday, wrap up and just cook on a weeknight? All of these questions will need to be answered later. Right now I have to see what's on the menu for this week, prep my shopping list and I'm off to the store. Melt butter over medium heat in a large skillet. When fully melted, add onion, carrot and celery to butter; sprinkle with some salt and pepper and let cook till tender and onion iridescent - approx 12-15 minutes. In the meantime, prepare your chicken - either dicing and cooking over medium heat in a non-stick skillet, seasoning with salt and pepper; or shredding left over roasted chicken. Line your pie dish with one of the pre-made pie crust. Gently form to the edges of the pie dish. When the onion/carrot/celery mixture is ready, add peas, parsley, thyme and flour. Cook, stirring often, until flour has coated all of the veggies and is cooked through, approx 5 minutes. Salt and pepper lightly for seasoning. Next add heavy cream and chicken broth and bring to a simmer until mixture thickens, then add the chicken. Do your final tasting and then add salt and pepper if needed. Pour mixture evenly over the pie crust. 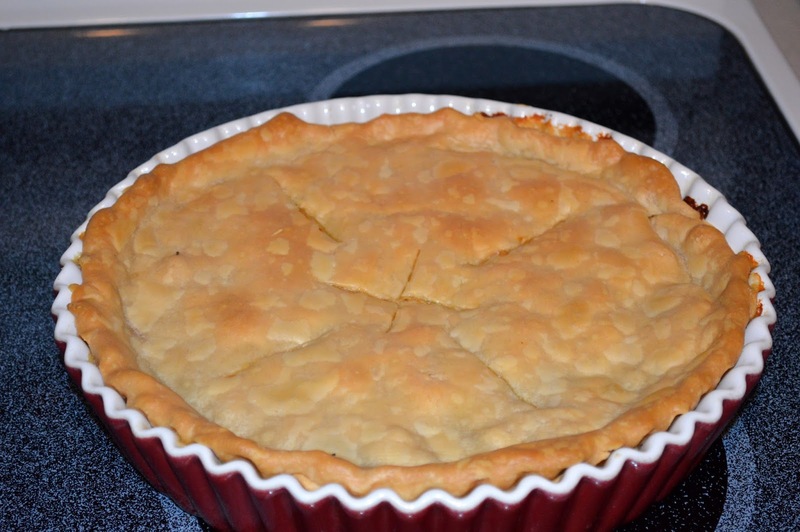 Top with remaining pie crust and cut small holes in top to vent while cooking. Place in oven and cook for 30-40 minutes until crust is golden brown. Let set for 5-10 minutes before cutting into. Cut and serve like pie slices.